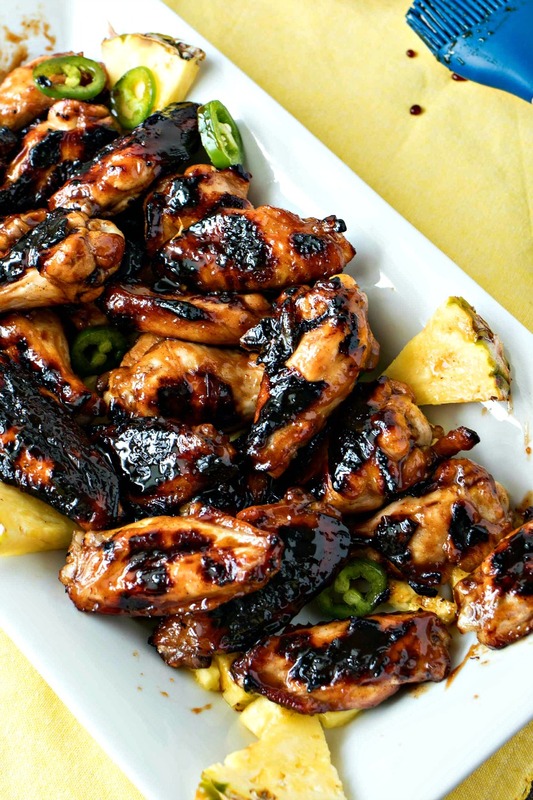 Jalapeño Pineapple Sticky Wings – The best recipe for sticky, sweet, and spicy wings! These wings are grilled and tossed in a jalapeño pineapple sticky sauce for the ultimate summer appetizer for your barbecues and parties. Summer is here! Who else is loving the warm weather for a change? Sorry for you folks who aren’t feeling it yet. Stay strong – it’s comin’ soon! In honor of the beginning of summer, I gotta do a grilling recipe – I just GOTTA! My first thought was to do a wing recipe. I have been OBSESSED with wings ever since high school. Me and my friends would spend Monday nights inhaling $0.25 wings like it was nothing. Ah, to be young again. In my opinion, wings taste much better on the grill. But then again, what doesn’t taste much better on the grill. It’s the only way I’ll eat chicken or pork at home, nowadays. It’s probably because of the delicious flavor you get from the charred grill marks. You’ll get plenty of those with this wing recipe. Ah yes…let’s get to the recipe, shall we? This incredible wing recipe will blow you away. The marinade is also what we’ll use for the sauce. So we get chicken that is super tender and a sauce that keeps them ultra sticky. And without further ado, here are my Jalapeño Pineapple Sticky Wings! Marinading chicken is my new favorite thing. Before last year, I always skipped that step because (1) who has time to wait 4-6 hours for chicken to marinate and (2) does it really make a huge difference? After making these grilled cilantro lime chicken skewers, I knew the answer was a resounding YES! The chicken becomes so unbelievably flavorful and juicy. It made the extra prep work soooo worth it. And these wings are no different! You’re going to get ultra-tender, flavorful chicken that will make the marinating process so worth it. But for these wings, you’re going to want to start the marinating process the night before. That will give the wings plenty of time to marinate overnight before you grill them that afternoon. After the wings are done marinating, all you need to do is pat them dry, grill them, and then toss in the sauce, which we will make with the marinade we set aside. Boom – that’s it! For the sauce, you will use jalapeño jelly. You should be able to find it in the jam/jelly section of the grocery store. Once the chicken is marinated, throw away the used marinade. This should NEVER be used for the sauce since the raw chicken was sitting in it. This is why we separate the marinade into two parts at the beginning. When adding the sauce to the grilled chicken, add about half of it first and see if that’s enough. Add more, as needed. It all depends on how saucey you like your wings. And that’s all there is to it! I hope you have a chance to make these amazing wings sometime this summer. Let me know how they turn out by commenting below! The best recipe for sticky, sweet, and spicy wings! These wings are grilled and tossed in a jalapeno pineapple sticky sauce for the ultimate summer appetizer for your barbecues and parties. Prepare chicken wings by separating tips, drummettes, and wingettes. Discard tips. I found that the best way to do this was to slice through the joints with a sharp knife. Place wings into a gallon-sized plastic bag. Set aside. Place jalapeno jelly in a large microwave-safe bowl and microwave until it is easy to whisk, about 30-60 seconds. Add soy sauce, pineapple juice, honey, brown sugar, red wine vinegar, and all spices, except cornstarch. Whisk together until combined. Scoop out 1/2 cup of marinade and pour over the wings. Seal plastic bag and shake to coat wings in marinade. Let it marinade for 12 hours in the fridge, flipping the bag a couple times. Cover rest of marinade and place in fridge. When ready to grill, preheat grill to medium heat, about 350 degrees. Remove wings from fridge and drain them from the marinade. Discard marinade. Pat them dry. Once grill is hot, brush with oil to keep wings from sticking. Place wings on grill and cook until cooked-through, about 10 minutes on each side for a total of 20 minutes. While wings are cooking, place leftover marinade in a medium sauce pan with 2 teaspoons of cornstarch. Whisk to combine. Heat on medium-high heat until boiling then reduce to medium heat to cook for 5 minutes so it can thicken. Turn off heat and let it cool on the stovetop. Once wings are cooked, brush with thickened sauce. I put a couple coats of the sauce on my wings to make them extra sticky. Serve immediately. You had me at jalepeno pineapple… That flavor combo sounds amazing! What an amazing sweet and spicy combo! You had me at wings. Then you added the sauce. Then you said ‘BBQ’. Definitely trying these! These look amazing! My husband loves wings! We will definitely be trying these this weekend! Yay! Hope you love them! Perfect! Let me know how you like them! I love some good chicken wings! Hubs is more into the spicy, so this would be perfect for him! Thanks for sharing! Ahhh nice! Since we’re using jalapeno jelly instead of fresh jalapenos, it’s not as spicy as you’d expect. So you may end up liking them too! Oh my goodness delicious! These are going to be made in my home this weekend. Thanks for sharing! Sharon, I’m loving these. Can you believe I’ve never made wings on the grill. All those spices together are perfect! I bet you could put that in a shaker and make a rub…But first, this sticky sauce! Ahh what a great idea! I bet a rub would be amazing! And you’re mind is gonna be blown once you taste these babies on the grill. These wings sound perfect for a summer bbq! Cannot wait to make them. Yesssss! Let me know how you like them! Chicken wings are a staple in our house. These sound delicious! I love this mixture of sweet and spicy! Great for summer! Can’t wait to try these!! Oh my glee! These wings look amazing! I am totally going to try this for my family, they would love it! My mouth is literally watering just looking at these! I LOVE jalapenos so this is right up my alley, especially because I absolutely love wings. I’ll definitely be adding these to my list of things that I MUST make! Yay! So glad I spoke to you with this recipe. I hope you love them once you get a chance to try them! I am so psyched to make these! What’s better than a spicy sweet treat?! These are going to be the perfect summer grilling app! Right?! You’re gonna be obsessed over these wings! This looks like the perfect summer recipe to throw on the grill! I’m not a huge spice fan, but I think my hubby would love these!! My family loves wings. I’m always looking for recipes to mix it up! These look delicious. This is something my husband and daughter would BOTH LOVE! Such a perfect addition the summertime table. I’m having folks over this week for dinner, I think I need to add this to the mix! They all thank you! Your wings look incredible! Love the dark charred bits and all the sticky, yummy flavour! Grilling is my favorite in the summer! Love the combo of hot and pineapple too! These sound so delicious! I love the sweet spicy flavors! So yummy! These sounds and look soooo good! Two of my fave flavours together! I love sweet and spicy foods! This would be great to add to my rotation. Thank you! My friends would absolutely love these, I am so going to save this recipe for our next braai – which probably wont be until winter now seeing as it’s too hot but never to early to plan ahead! Looks like it would be a great recipe for summer!